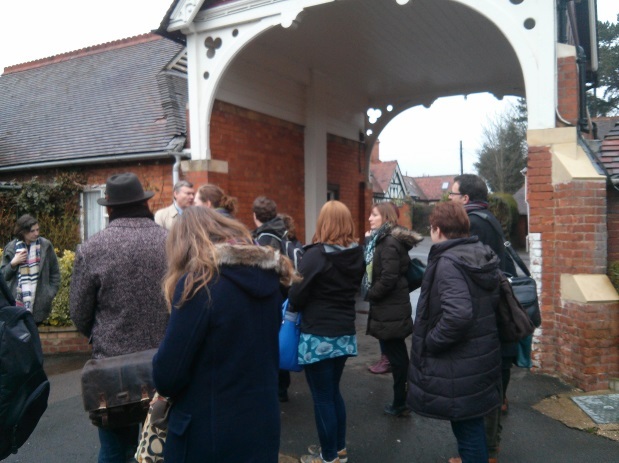 The latest SEMFed study day at Bletchley Park saw 21 members gathering at the former codebreaking centre. We were very honoured to be greeted by the CEO of Bletchley Park, Iain Standen, who gave us a brief overview of the Park and plans for future developments. Iain then handed us over to Dr. David Kenyon, the site’s research historian, who very kindly stayed with us for the whole of the day and answered all sorts of questions! The first hour of the day was a tour of the park, looking at the original mansion and hearing how the site expanded rapidly from around 130 to 10,000 people in the first few years of the Second World War. The site was saved for the public in 1991 and stories are still coming out about the people who worked there – veterans are now allowed to discuss everything which they did before 1945, but many are still unwilling to talk about it. The site is now rapidly expanding again, with thousands of visitors rather than workers, and the process of changing from a largely volunteer-led museum with a lot of private collections to a museum run by museum professionals has had its challenges. Veterans are a very important part of the site’s history and some of them are featured on the multimedia guides which visitors can use for free. We then moved into the mansion (and into the warm!) to meet Guy Revell, the Archivist, and Nicola Gale from the learning department. They gave us the opportunity to look at some amazing items from the collections, including transcripts of messages, pictures drawn by those working at the park, programmes from drama groups and a real Enigma machine. Nicola talked about the fact that all school visitors are able to touch the real machine, which really brings the history of the site to life. She also talked about the museum’s commitment to bringing their collections up to date by discussing cyber security, which has the same problems as Enigma coding in that the weak spots are in the users rather than the computers. We were allowed to code and decode a message on the Enigma machine – as the message read “I am hungry”, it’s probably just as well that lunch in the excellent Hut 4 café was next on the agenda! After lunch we were introduced to Kate Travers, Head of Education, and Jonathan Byrne, in charge of oral history, as well as Guy and David. Kate explained that the site is unusual in having more secondary than primary students, mostly looking at maths and coding, and in having a large number of foreign groups. There is also an outreach programme which the Park is looking at making more focussed to local groups. Jonathan talked about meeting veterans and adding them to the Park’s Roll of Honour, and of the difficulties of working out the difference between what people knew when they were working at the park and what they have found out in later years. Members were able to ask questions and received very interesting answers. We are very grateful to all of the staff members at Bletchley who gave their time and I certainly had a fantastic day. It was great to welcome some new members to the event and we hope to see them again in Ipswich in May, or Hitchin in July.